U.S. appeals court denies Manning’s bail request, upholds contempt finding, Sarah N. Lynch, 24 Apr 19, WASHINGTON (Reuters) – Former U.S. Army intelligence analyst Chelsea Manning will remain in jail after a federal appeals court on Monday denied her request to be released on bail, and upheld a lower court’s decision to hold Manning in civil contempt for refusing to testify before a grand jury. The ruling is a blow to Manning, who has been detained since March after she declined to answer questions in connection with the government’s long-running investigation into Wikileaks and its founder Julian Assange. “I don’t have anything to contribute to this, or any other grand jury,” Manning added. Assange was arrested on April 11 at Ecuador’s Embassy in London, after U.S. prosecutors in the Eastern District of Virginia unsealed a criminal case against him alleging he conspired with Manning to commit computer intrusion. ……Manning has tried to fight the grand jury subpoena in the Assange case, citing her First, Fourth and Sixth Amendment rights under the Constitution. B — Remember that whoever you’re debating probably doesn’t really know much about the claim they’re making ……. F — When attacking disinformation on Twitter, use this tactic:……. G — Point out at every opportunity that they are advancing a smear……..
H — Make it about Assange’s imprisonment and extradition……. I — Familiarize yourself with common logical fallacies….. The report confirms the warnings made by the WSWS and others that the charges related to computer hacking leveled against Assange are merely a pretext for his extradition to the United States, after which additional charges would be brought against him. 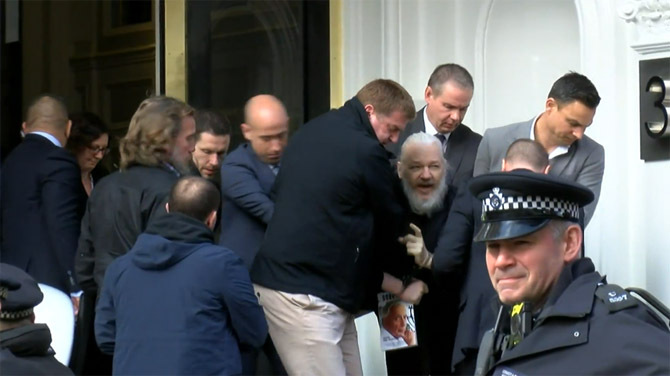 On April 11, Assange was expelled from the Ecuadorian embassy in London and arrested by British officials on the public charge of conspiracy to bypass a password. That charge dated back to events in the 2011 WikiLeaks’ publication of the Iraq and Afghanistan War Logs. Chelsea Manning turned over more than half a million documents exposing US war crimes and corruption to WikiLeaks for publication. The expulsion and arrest of Assange has been accompanied by an unrestrained campaign of media vilification aimed at transforming Assange into a non-person, undeserving of democratic rights. But since Assange has been imprisoned in the maximum-security Belmarsh prison, public comments made by leading Democrats and US media officials indicate that charge was not the primary aim of the US investigation. In December 2017, US prosecutors told a federal judge they wanted to keep secret the charges Assange might face because learning of them might have caused him to flee the Ecuadorian embassy. According to CNN, the recently unsealed documents indicate that a grand jury in Virginia indicted Assange in 2018 and prosecutors again demanded the charges be kept secret for the same reason, and added their worries about evidence tampering and witness intimidation. Cassandra Fairbanks, of the right-wing outlet the Gateway Pundit, visited Assange more than once during his imprisonment in the London embassy offices. She confirmed her visits with Assange have been the subject of the recent investigation. She told the World Socialist Web Site, “I was informed on Monday that there is a secret grand jury against Julian and two witnesses were questioned about me meeting with him, though they have not subpoenaed or questioned me directly. Since Assange’s arrest, CIA whistleblower John Kiriakou, who was prosecuted by the Obama administration in 2012 for exposing the torture of detainees, has taken to social media to emphasize that Assange has no chance of a fair trial in the US. “A fair trial in the Eastern District of Virginia, under Judge Leonie Brinkema, is utterly impossible. They don’t call EDVA the ‘Espionage Court’ for nothing,” he wrote. The New York Times, Britain’s The Guardian, Spain’s El País, France’s Le Monde and Germany’s Der Spiegel all published the WikiLeaks files provided by Manning. How could they not? WikiLeaks had shamed them into doing their jobs. But once they took the incendiary material from Manning and Assange, these organizations callously abandoned them. No doubt they assume that by joining the lynch mob organized against the two they will be spared. They must not read history. What is taking place is a series of incremental steps designed to strangle the press and cement into place an American version of China’s totalitarian capitalism………. Daniel Ellsberg Calls Chelsea Manning “an American Hero” Marjorie Cohn, Truthout, March 20, 2019 Two years after being released from prison where she had served seven years for exposing U.S. war crimes in Iraq and Afghanistan, Chelsea Manning was jailed once again for refusing to answer questions before a grand jury investigating WikiLeaks and its founder Julian Assange. Nuclear files removed from UK National Archives so that they can no longer be accessed by the public. The National 11th Feb 2019 ACCIDENT reports and safety reviews into nuclear weapons and atomic energy programmes in Scotland are among hundreds of documents to have been suddenly withdrawn from public view. Dumfries and Galloway and the Hunterston A and Hunterston B power stations which are located in Ayrshire.